Mode 2, internationally acclaimed British artist and legendary writer, will present a new body of work:twelve large and medium-scale canvases and a site-specific wall painting. For his first exhibition in Milan, the artist leans towards deconstructing image into its separate principles: harmony, dynamism, musicality, and rhythm. The interplay of light and shadows brings out the volumes, and the symphony of bodies materialises in an instant that defines the transition from figurative to abstract. And so the image becomes a reference to movement in a sort of synchronised dynamism, much like a song segueing into an instrumental piece. 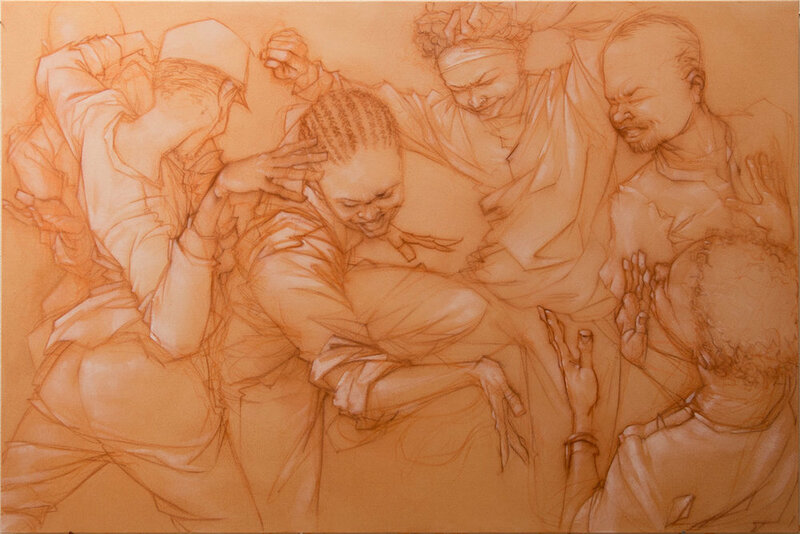 Corporeal movement and the notion of rhythm are key to understanding Mode 2’s work, as a result of his innate ability to observe and capture on canvas the energy that dance and music exude, the social interaction and physical expressiveness of people at parties or in clubs. Born in Mauritius in 1967, at the age of 9 Mode 2 moves to London with his family where he completes his studies. During the 1980s, he approaches Hip Hop culture, and writing in particular. In ‘84 he forms The Chrome Angelz and then Crime Time Kings, two crews whose members are some of the era’s best European writers located in London, Paris, and Amsterdam. These two prestigious crews are the first to define what then becomes known as “European” style, boasting Mode 2’s characters and Bando’s lettering. In 1987, one of Mode 2’s works was chosen for the cover of Spraycan Art, the first book to document the spread of writing, which was no longer confined to the urban context of New York but had gone global in every sense. This book, authored by Henry Chalfant and James Prigoff, is not only a milestone for generations of future writers, but it also exported Mode 2’s name and style to every corner of the planet. Mode 2 spent most of the 90s traveling and painting. He’s one of the most authoritative voices on Hip Hop culture. He participates in Hip Hop events not only as an artist, but also as art director and panel member. He writes articles, designs album covers, creates sets for live music events. At the same time, he begins to move his works onto canvas. He begins to use paintbrushes more and more often, though never completely abandons spray-paint. 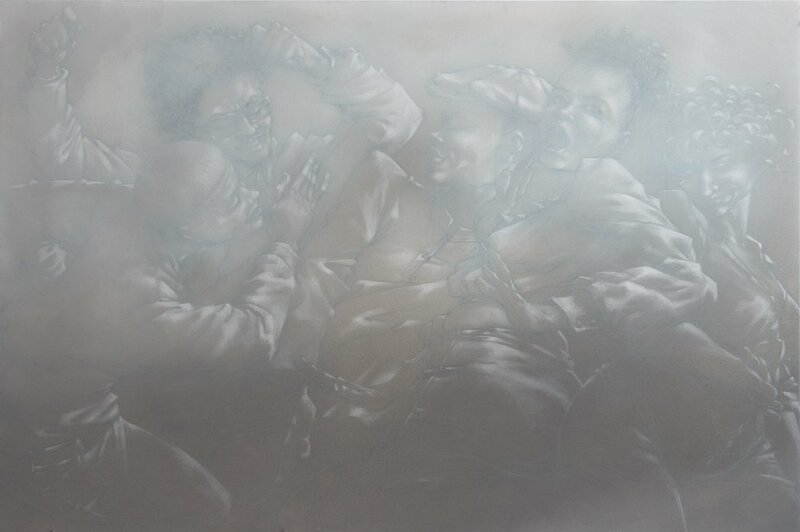 His artistic technique becomes ever more refined, and his translucent brush strokes define figures and depict the movement of his subjects: sensual female figures, clubbers and couples dancing. Mode 2 has shown his works in many galleries in Europe and worldwide, and he has painted numerous murals. He recently created a wall painting in Omagh, Northern Ireland, for a short film for a song on U2’s album, Songs of Innocence.